I’m just back from teaching four days at Road to California. I had never been to this show, which is in Ontario, California (east of Los Angeles). It is such a beautiful area, and the venue (the Ontario Convention Center) is wonderful. 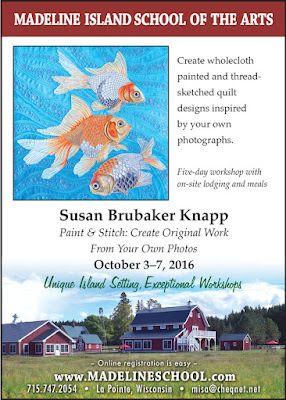 Big, well-lit classrooms; lots of great vendors; interesting exhibits; and of course, really fabulous quilts! 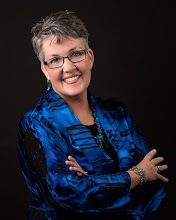 I had a professional headshot taken by Bonnie McCaffery, and snapped this selfie with her afterward. 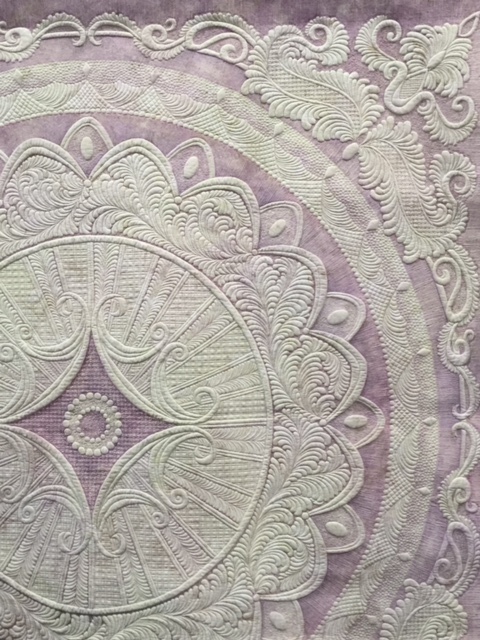 $10,000 Best of Show went to “Silk Road Sampler” by Melissa Sobotka of Richardson, TX. 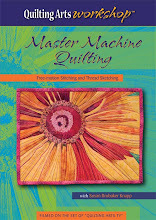 many purchased on eBay, with longarm quilters’ artistry, with fabulous results! Luba Dmytryk, who was in my class, won Viewers Choice! They did some amazing work! 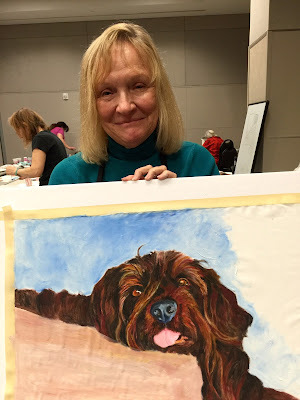 A few were experienced painters, but most were completely new to painting on fabric. My technique (which I developed to compensate for my lack of formal art training!) 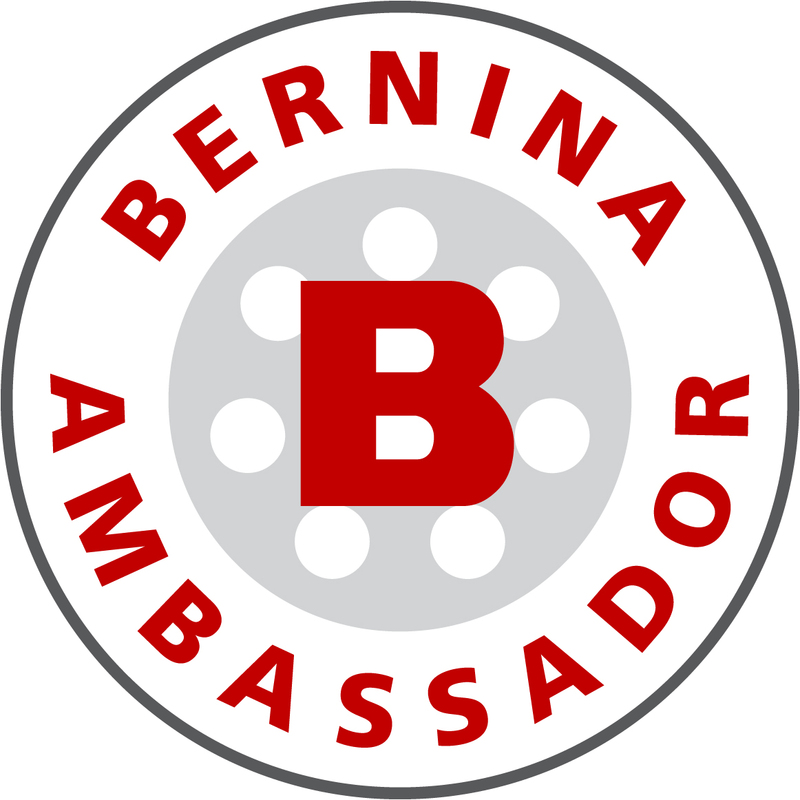 breaks this seemingly complex process down into simple steps, so that even beginners can get great results. Taking a three- or five-day class is a big investment of time and money, but it also gives you the opportunity to really get an in-depth learning experience. 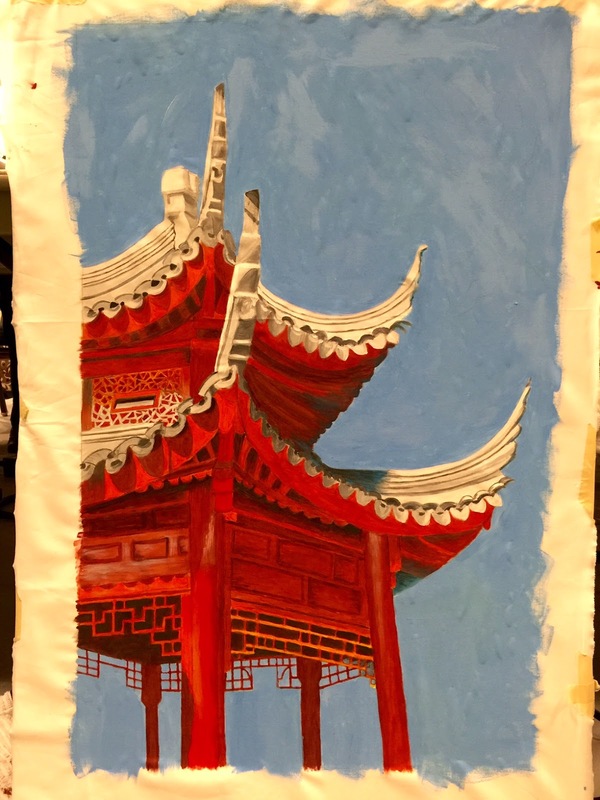 Some of my students painted all three days; others did smaller or less complex pieces and were able to threadsketch – and in two cases – quilt – their work! 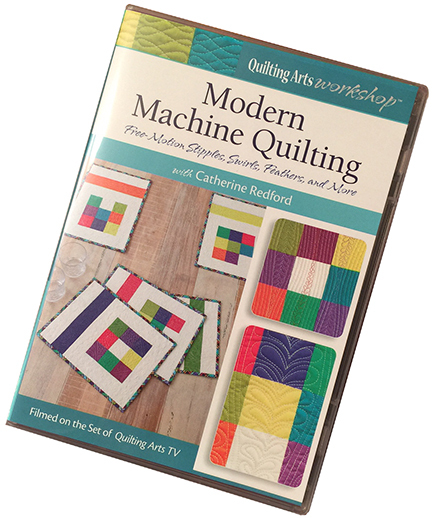 Catherine Redford, fiber artist, teacher and machine quilter extraordinaire, has a new Quilting Arts Workshop out on DVD and digital download. 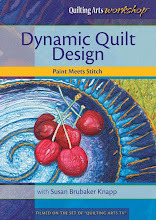 It’s called “Modern Machine Quilting: Free Motion Stipples, Swirls, Feathers and More!” It follows on the heels of her excellent first Workshop, “Modern Machine Quilting: Straight Lines, Spirals, Serpentines, and More!” that I reviewed in December 2015 here. 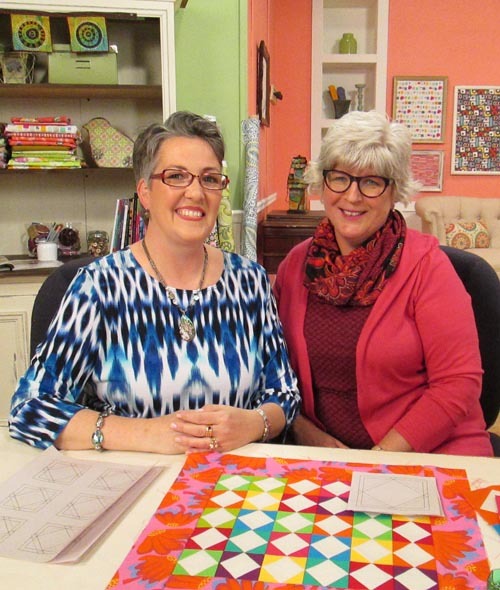 Catherine is a co-founder of the Naperville (Illinois) Modern Quilt Guild, and she’s an award winning quilter. 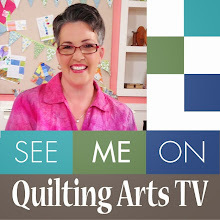 She’s been a guest on Quilting Arts TV several times, which is where I first met her. 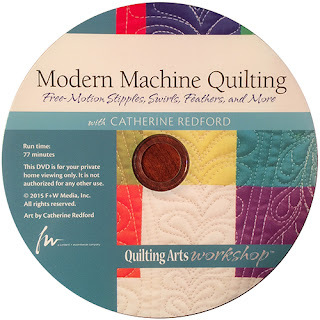 In this Workshop, Catherine starts out with the basics: how to choose batting, thread, needles and presser feet; how to press (she sometimes presses seams open to achieve a flatter look); and how to pin baste in preparation for quilting. 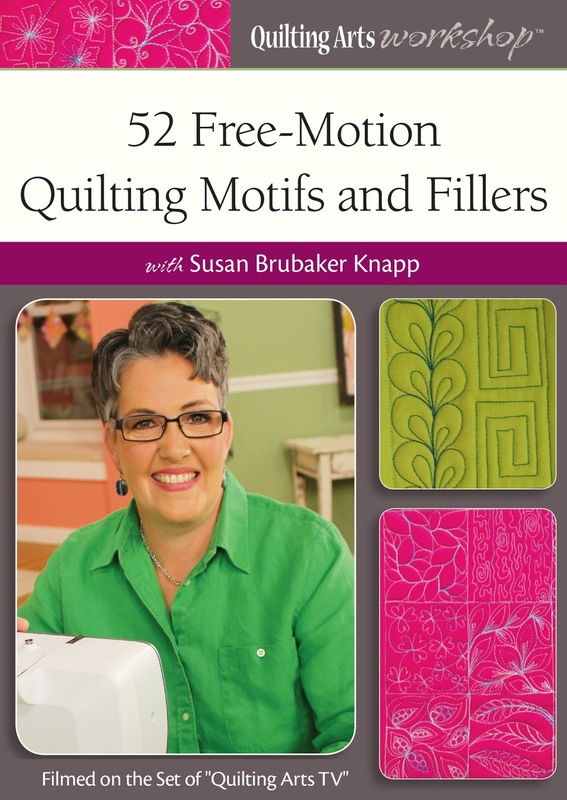 Even though I’m an experienced free-motion quilter (I have my own recently released Quilting Arts Workshop on free-motion fillers), I learned a lot from Catherine by watching this Workshop. She explains why she prefers an open-toe darning foot for her free-motion quilting (she says she can see better where she is going). 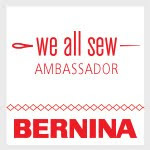 I use a closed metal circle (Bernina foot #15). But if she has hand stitching or embroidery on a quilt, she uses a closed-toe foot so she won’t snag her stitching. 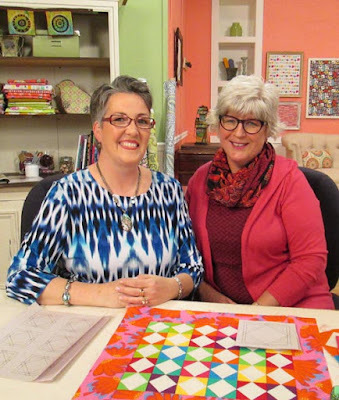 She prefers a single-hole throat plate when she quilts, because it does not allow the fabric to be pulled down into the larger opening on a regular throat plate, which results in a nicer stitch. 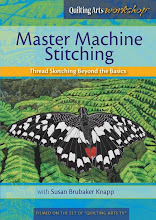 While this Workshop focuses on free-motion stitches using a darning foot, Catherine often notes that she uses a combination of quilting lines made with her walking foot and motifs made using a free-motion darning foot in the same quilt. If it’s easier to get straight lines (or mildly curving lines) with the walking foot, then do it. 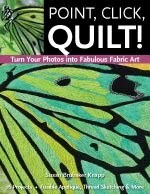 These lines can provide the structure for the rest of the quilting. Then put on the darning foot and fill in between those lines. She usually starts out by drawing or doodling her motifs on paper, before stitching them. 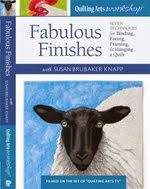 She relies on “muscle memories” build during this drawing practice to help her when she starts quilting her quilt. I found her explanation of her stitches as she drew them on paper very illuminating. 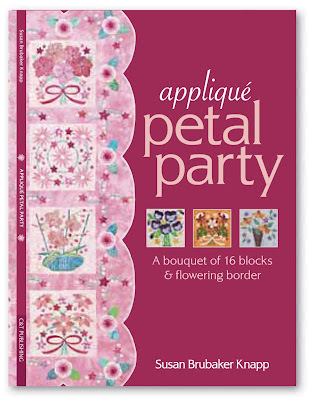 By both drawing and stitching the motifs, Catherine reinforces how to create the designs. During this 77-minute long Workshop, Catherine demonstrates 26 different motifs, including great patterns to define areas, fill white (empty) space, and highlight borders. There are some beautiful new-to-me motifs that I’ll be adding to my repertoire! 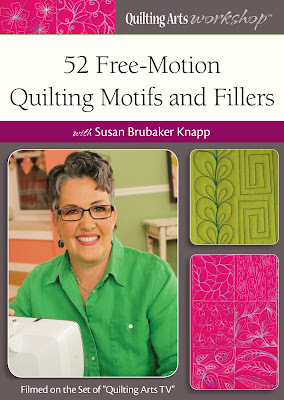 You can purchase the DVD ($24.99) or digital download ($19.99) on the Quilting Daily Shop. Saturday January 16th – Back to Catherine! Win this Workshop on DVD! For a chance to win Catherine’s DVD, head over to Catherine’s website and leave a comment there. At the end of the blog hop, she’ll pick two DVD winners, and one grand prize winner, who will receive a DVD and a Stella task lamp. UPDATE: We have a winner! Sewgirl has won my give-away. Thanks! 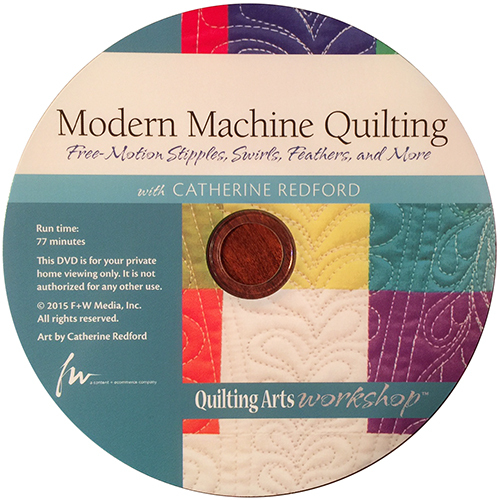 For a chance to win my Workshop DVD and Catherine’s, leave a comment on this blog post.